Tata has joined the motown bandwagon of launching electric cars with the all-new Tiago and Tigor EV. Tata Motors had won a tender for the supply of 10,000 electric vehicles to the government-run EESL. The all-electric versions of the Tata Tiago hatchback and Tigor compact sedan have got their first public showing at the 2018 Auto Expo. The two models are part of Tata’s big plans to offer a wide range of electric models in the years to come. Save for some minute details, the Tiago EV and Tigor EV are near-identical to their conventional-engine-powered versions on the outside. These versions get the addition of blue decals on the sides and ‘EV’ badging on the grille. On the inside too, it’s only the unique knob-like gear lever to tell it apart from the standard version. Both EVs run the same specification and are powered by a 3-phase AC induction motor with a peak output of 30kW at 4,500rpm. The power figure equates to about 40hp, so performance will be far from electrifying – and that’s before accounting for the effect of the added heft of the battery pack. Tata has not disclosed any numbers about range or battery capacity as yet, though the release does mention ‘fast charging’ capability. 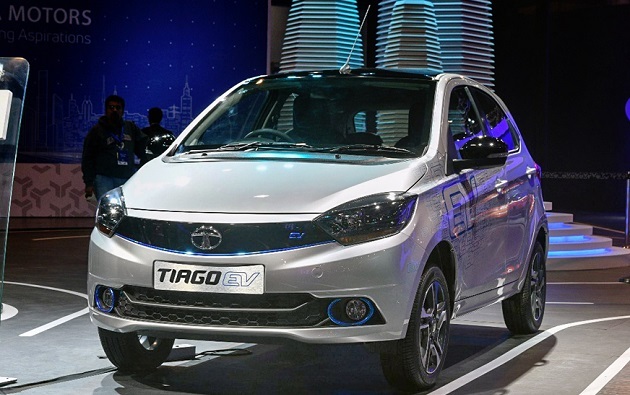 Notably, Tata Motors had won a tender for the supply of 10,000 electric vehicles to the government-run Energy Efficiency Services Limited (EESL) last year and started deliveries of the first lot of Tigors in December 2017. The petrol and diesel variants of Tiago and its older sibling have been doing good in the Indian market. In fact, these cars, along with the Tata Nexon have helped in plunging Tata to its old glory days. It would be interesting to see, however, whether or not their electric variants would be accepted equally warmly by Indian car buyers. Tata is expected to launch the electric versions of the Tiago and Tigor later this year, but they won’t come cheap with prices likely to be upwards of Rs 10 lakh.